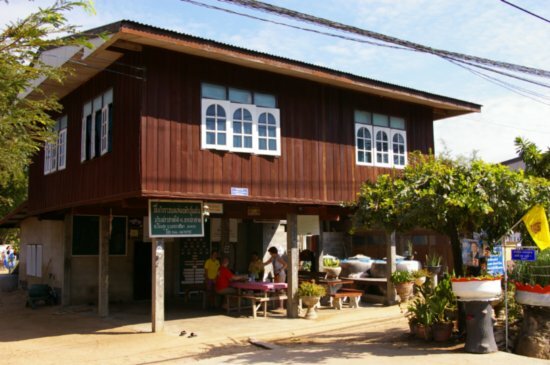 Picture: Check twoelders travel blog on Ban Prasat homestay on Travelpod. A fantastic way to discover Thailand country side and way of life is to plunge into village’s tradition by staying in villagers home and enjoy local activities and customs. Ban Prasat Homestay is an offical and certified Home Stay Project program in Nakhon Ratchassima province with The Tourism Authority of Thailand. This program offer the possibility to stay and discover real life with villager in about 15 villages across Thailand ranging from Thai Elephant Camp in Lampang to the gorgeous and warmly Koh Yao Noi community island in Phang Nga bay. As there are numerous attractions in the area, home stay is an alternative for visitors interested in spending more than one day at Ban Prasat. The program was first initiated in 1996 and currently serves as the prototype home stay program for other villages across Thailand. The best time for a visit is between October and December when the climate is cool. Ban Prasat villagers, like other villagers in the region, are mostly farmers. Because rice farming is done once a year, villagers use their free time to supplement their income by creating handicrafts such as weaving reed mats and hats, producing shoes and bags, breeding silkworm, and making Thai stringed musical instruments like So U and So Duang. Paddy fields surround the village and a river, Than Prasat, which is considered a sacred river, divides Ban Prasat Nua and Ban Prasat Tai. For more information on home stay programs, contact the village headman Mr. Thiam Laongklang, tel. (66) 4436-7075 or Mr. Charan Chomklang, tel. (66) 4436-7062. Learn about the local way of life, visit archaeological sites, take part in community activities such as textile-weaving and the preparation of food and desserts. Gallery | This entry was posted in Editors' Picks, Khao Yai Accommodations, Khao Yai Travel Guide, Other Accommodations, Pak Chong Tourism, Pak Chong Travel Guide, Pak Chong Vacations and tagged Ban Prasat Homestay, Korat, Nakhon Ratchassima, Thailand homestay. Bookmark the permalink.